Visiting Arenal Volcano and the surrounding area. Arenal Volcano with it’s classic conical shape and sitting on a flat plateau is the icon of volcanos. Arenal Volcano is the most popular of all Costa Rica volcanos. Erupting in 1968 and coming back to life ; the volcano continued with small daily eruptions until 2010 when it stopped it’s daily expulsion of lava. Arenal Volcano is still considered active and continues to occasional send smoke from it’s crater. 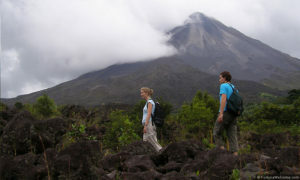 Arenal Volcano is surrounded by and protected as a National Park; Volcan Arenal Parque Nacional. In reality, the national park has two volcanos – Arenal Volcano ( 5,000 ft.) and Chato Volcano the 3,700 ft. Chato Volcano has been inactive for thousands of years and has a crater with a picturesque lake. For the more adventurous, hiking to Chato Crater is a fun experience. 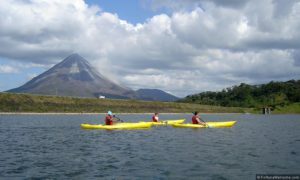 The Arenal Volcano area is most known for the hot springs and activities such as windsurfing and kitesurfing on Lake Arenal. La Fortuna is the largest and closest town to the volcano itself and is the most visited. A great place to stay just outside of La Fortuna is Leaves and Lizards Arenal Volcano Cabin Retreat. There is plenty to do in this area and many day tours to choose from. The most popular is a day at one of the many hot springs, or white water rafting, horseback riding to La Fortuna Waterfall, enjoy SUP on Lake Arenal or a party cruise on the lake as well. There are so many tours available from this area that you could easily spend a week. The northern coast of Lake Arenal and the town of Nuevo Arenal are host to many unique boutique hotels such as Villa Decary and Arenal Springs Villas. Enjoy a meal at Gingerbread Fine Restaurant and Boutique Hotel. 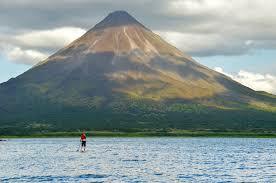 Nuevo Arenal is a fantastic place to go for windsurfing, kayaking, and fishing for Guapote / Bass and Rainbow Bass. The area is full of wildlife such as monkeys, toucans, parrots and parakeets. It can get quite windy so kiteboarding and windsurfing events are regularly held. As you wind around the western end of Lake Arenal near the town of Tronadora is Lake Arenal Hotel and Brewery just one-and-a-half hours from Liberia Airport and three hours from the San Jose Airport. They offer a wide variety of on-site activities ranging from tennis, a skate boarding park, a pool for lounging and more. Of course the principal attraction is the Brewery. 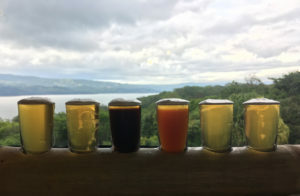 Proudly home to Costa Rica’s first microbrewery, Lake Arenal Hotel serves an international menu of farm-fresh food at its on-site restaurant, La Huerta. 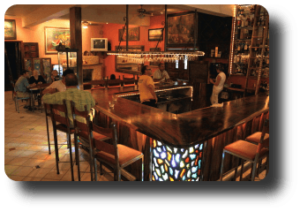 Come enjoy the relaxed ambience, delicious food, and what many of our customers say is the “best beer in Costa Rica” produced on-site by Lake Arenal Brewery. Visit Arenal Volcano and its surrounding areas. You can wake up to a Volcano, howler monkeys, and toucans right outside your door!